is pleased to introduce Vert! If you’ve ever wondered what life looks like through the eyes of a spine, you’ve landed in the right place. 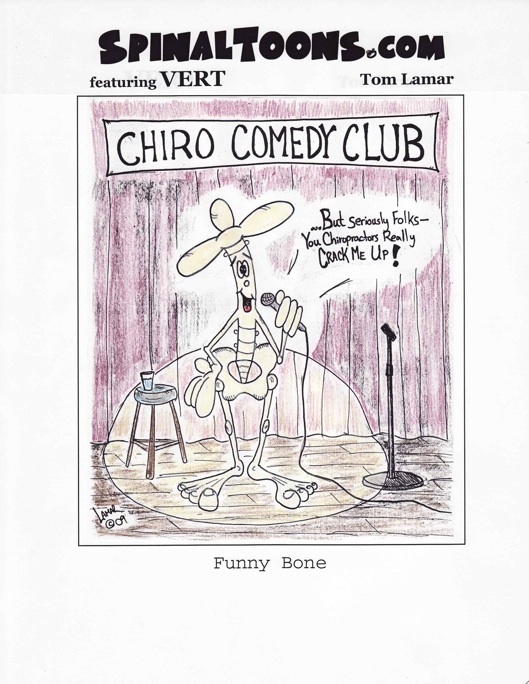 Click here for explanation of “Funny Bone” cartoon. Hello, my name is Dr. Thomas Lamar, and I am a chiropractor in Kingston, Washington. 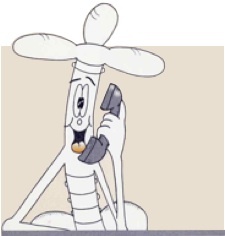 Back when I attended Los Angeles College of Chiropractic (1992 — 1995), I created the cartoon character “Vert” — Mr. Vert teBrae, to be more formal. Vert had his own cartoon panel in the school paper and eventually was voted in as the college mascot. When I graduated, I had amassed some 41 cartoons (plus a couple extra) and compiled a book, complete with the story behind the character (and the cartoonist). Only 100 books were printed, one of which resides to this day deep in the bowels of the Copyright Office of the United States Library of Congress. At any rate, I have decided to “rerelease” this book in a high-tech, electronic form, along with other various Vert scrapbook items that die hard fans will appreciate. HOME is the page you are on right now. The LIBRARY contains a virtual “Card Catalog” of all of the Vert cartoons as they appeared in the original book. The library also contains some other Vert cartoons that did not appear in the newspaper, as well as some brand new ones (like the 2009 “Funny Bone” panel above). Clicking on the thumbnail images will take you to larger, more enjoyable versions. STORY is the original 1995 Vert book in electronic format. You’ll learn all about the history of Vert, his cartoonist, and some “behind the scenes” details about the cartoon process itself. For your convenience, you’ll also find the book’s Table of Contents listed in the left column. The DECODER is a special feature of this website that the book did not contain. While most of the jokes have a “humerus” angle [pun intended] to them, I always attempted to throw in a nugget or two that would only be funny to someone schooled in chiropractic. This “decoder” lets the rest of you in on the “full joke” by giving you the necessary anatomical/chiropractic background as well as telling you what I was thinking when I created it. Look for the icon and click it to get the full scoop. The STORE is where, in the future, you’ll be able to purchase various “Vert things.” Currently Vert and Dr. Lamar are working on a special chiropractic coloring book meant for younger patients: “How to Have a Happy Spine.” Release date is slated for early 2010! Finally, the CARTOONIST tab gives you a little bit of information about me. P.S. I invite you “sign our guest book” in the Comments Section below. Or, if you prefer, you can contact me via email through my main website. P.P.S. Become a “Fan” of Vert through Face Book! This a great place for Vert followers to hang out and talk to, and about, Vert. Plus, you’ll get insider updates on what’s going on in Vert’s world. P.P.P.S. (boy that’s a lot of “P’s”) Subscribe to Vert! 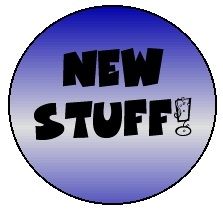 For those of you who want to keep your fingers on “Vert’s Pulse,” put our RSS feed in your favorite news reader or aggregator (such as Bloglines or Google Reader). All of the newest Vert cartoons will be sent out this way (in addition to just being on this site), as well as any Vert “Press Releases.” Also, know that the “Vert Scrapbook” is bound to have a new thing or two added periodically. There’s no telling how much extra stuff Dr. Lamar will find. All rights reserved. Any use without permission is prohibited.